AKOS is also just a little window nook, squeezed into a kind of alley between shops. 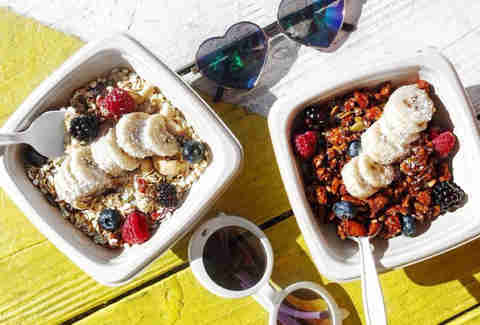 Named for a lyric in a Sun Ra song, this tiny cubbyhole serves up some of the best paleo-style breakfast, smoothies, granola and acai bowls, and special buttery coffee found anywhere on the Westside. There's open air bench seating if you're lucky, but the vibe here is so overwhelmingly So-Cal that you probably won’t mind standing in the sun. This is a perfect place to start your tiny day. 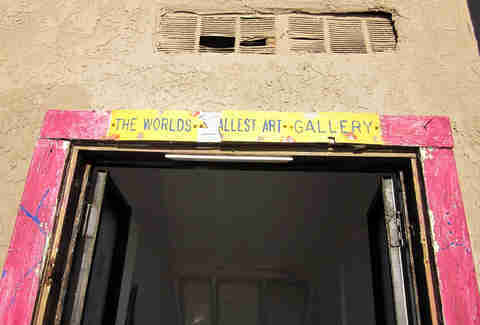 Located on the world famous Venice Boardwalk, this art gallery is actually a closet. It began as an adjunct location for local legend Sponto's Gallery around the corner from the main gallery on Dudley Avenue. Sponto passed away and the tiny gallery became the headquarters for another local legend, Tree Man. Ostensibly, it’s a gallery, but there aren’t any signs of commerce being conducted. A mysterious guy out front was busy painting, but wouldn’t answer any questions about the art for sale. Very Venice. This tiny patch of grass is clearly meant as humor, which it is. 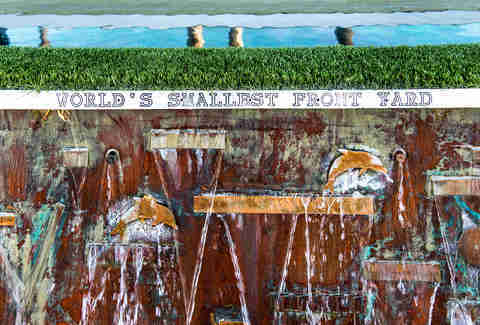 Mounted atop a water fountain wall streaming sheets of water, it's merely a little strip of grass that the owner of the big ocean front home has exalted with a shiny, metal sign proclaiming its status as the tiniest front yard in the world. The officials at Guiness haven’t yet verified this claim, but it would be tough to argue with. No matter, it's just fun. And funny. 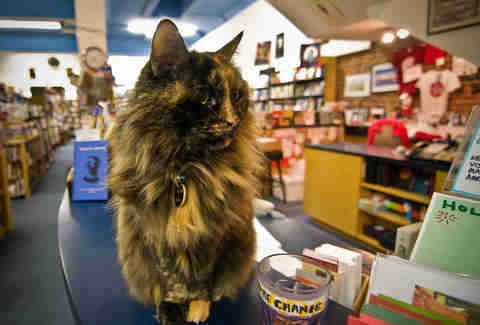 Tucked in behind the well-known Sidewalk Cafe on the Venice Boardwalk, the entrance to Small World Books doesn’t exactly announce itself. The Sidewalk Cafe actually came after the bookstore, when the owners thought there should be a little cafe for the book browsers, which is why many of the dishes have literary names (like the "Henry Miller", a monster pastrami sandwich). The book store isn't really that tiny once inside, it just feels that way because it's so packed with every book imaginable, from reissues of the classics to the latest best seller. The operation is owned and operated by women, who if they don't have what you're looking for, will be sure to get it for you. It’s a peaceful oasis away from the mayhem of the Boardwalk outside. 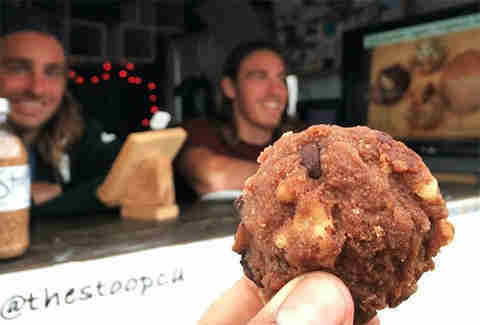 The Stoop is actually not even that, it's just a window cut into the front of an apartment, from where surfing brothers make and sell their exceptional vegan cookies. Kyle and Dustin Stewart came out to L.A. from their family's centennial farm in Michigan, and now make their crazy-good cookies using the wheat and grains shipped out from their Stuart Family Organics operation. The hours can be spotty if the surf is good, but if you catch them there sitting on their rooftop lawn chairs... you're stoked. The Harbor Room is truly tiny. Like, six bar stools tiny. Like the white haired longtime bartender can barely turn around behind the bar to sling his stiff drinks tiny. Which is exactly what is so great about it. Zero pretension, a vintage jukebox playing classic vintage tunes, and fairly vintage customers, judging from the demographic that is usually hanging out. This is a dive bar in the truest sense. 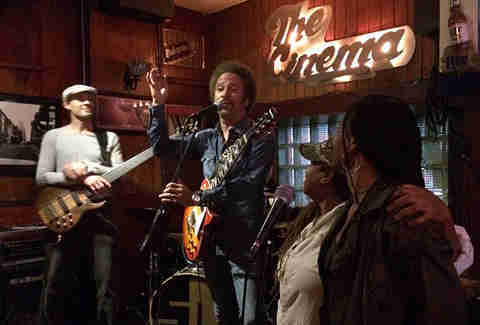 Not only is The Cinema Bar one of the tiniest live music venues in Los Angeles, it's also one of the best. The minuscule stage hosts many of the city's best troubadours, usually of the honky-tonk, singer-songwriter ilk, which is perfect for the intimate space. A small bar lines one side, and a couple bar tables are set up along the other side, but most likely you'll be standing as you tap your toes along. There is a small patio out back that serves as a place to regroup in the fresh air and somewhere where you can hear yourself talk. 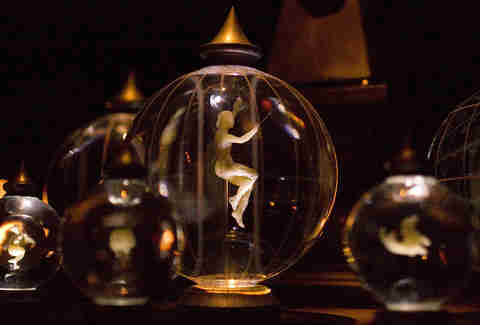 The cabinet of curiosities that is The Museum of Jurassic Technology isn't so small itself, but the collections inside feature some of the tiniest art works ever created. Founded in 1988 by husband and wife, David Hildebrand Wilson and Diana Drake Wilson, the museum is intended to be "an educational institution dedicated to the advancement of knowledge and the public appreciation of the Lower Jurassic." The Lower Jurassic, obviously, is the cooler of the two. The micromosaics by Harold Dalton, made from nearly invisible butterfly scales are really something, as are the microminiature sculptures by Hagop Sandaldjian that could probably be destroyed by a sneeze. Best of all, you can take them home via an old school Viewfinder available in the gift shop! Pretty cool. 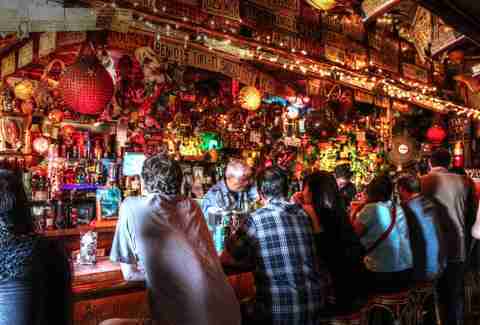 This authentically retro Tiki bar is legendary, as are the good times had by all who enter. Consider yourself lucky if you snag one of the 12 or so seats, then sit back and enjoy one of the at least 94 tropical drinks that have made this a drinker's institution since 1961. Family owned and operated still, "The Tik" is carrying on the nearly lost art of the exotic cocktail, many of which cannot be found anywhere else, and they are not messing around. Take the "Black Widow," made with rum, lime juice, fruit juices, and topped off with champagne, or the “Dr. 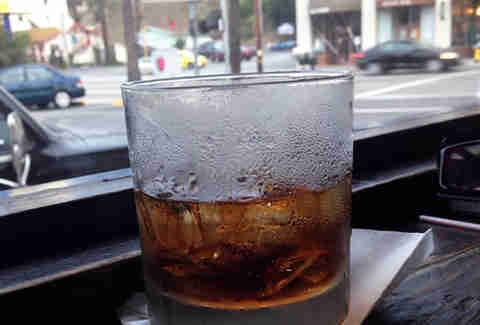 Funk," made with gin and a hint of black licorice. It’s worth a trip just to check out these crazy drink names. Oh, and bring cash, because that's all that's gonna get you one of their famous Tiki creations. 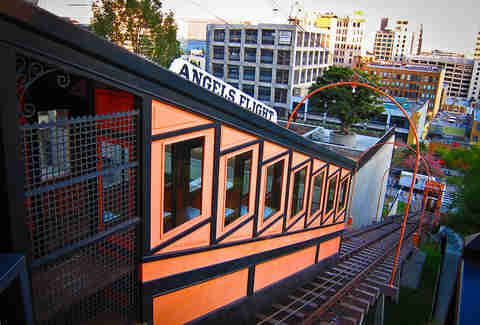 Angel's Flight Railway is most likely the smallest one you'll ever see. 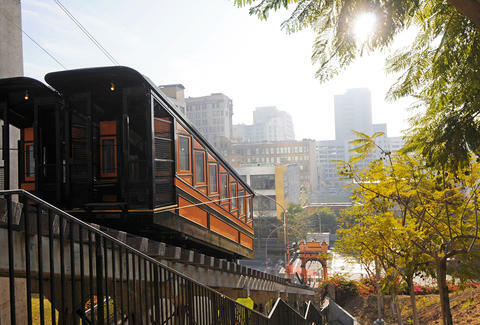 Really a "narrow gauge funicular," Angel's Flight opened in 1901 to shuttle downtown workers up and down the Bunker Hill area of the city. The two rail cars, Sinai and Olivet, have not been in operation since 2013, following some safety concerns. 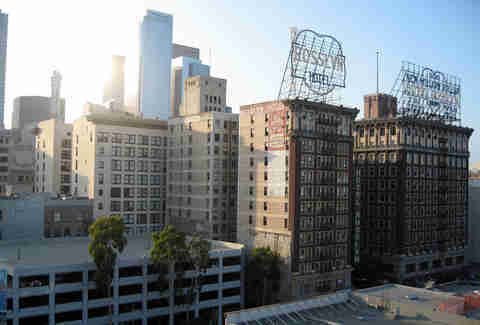 Though not currently available to ride, efforts are being made to get this historical landmark back up and running as soon as possible, and the structure is still pretty cool to check out if you're in the neighborhood.